Welcome to Copied Hall Kennels. 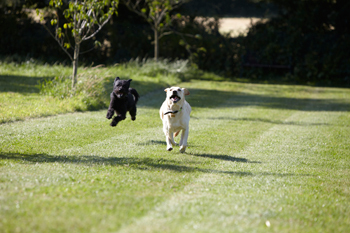 We are a Free Range boarding kennels situated in the New Forest in Hampshire. Free Range Kennelling allows sociable dogs the opportunity to mix and play with other dogs during the day, but have their own individually allocated kennel at night for the duration of their stay - giving your dog a ‘real holiday’ too! However if you opt for your dog(s) to be kept apart from others they will be given a family pen with their own yard and allotted bedroom. All dogs will be run off the lead in our big grassy field or orchard twice a day in groups or individually. Vaccinations – All dogs must have their annual vaccinations up to date. They MUST also all have the Kennel Cough Vaccine before they stay at Copied Hall Kennels. Kennel Cough vaccine – must be given to your dog at least 5 days before boarding begins. Most kennel cough vaccines are now valid for 12 months but check with your vet as they do vary. DownLoad More Information on Kennel Cough Here! 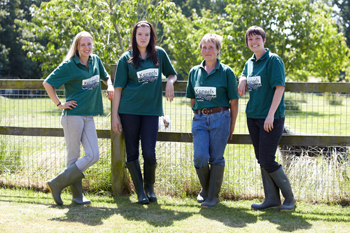 Copied Hall Farm Kennels was founded by Phillip Forshaw in 1980. Mr Forshaw had served in the Far East as a Captain in the Army. After decommissioning he worked for BAT in Indonesia where he met his Indonesian wife Hettie. They moved back to England together in 1961 and bought Copied Hall Farm. Shortly afterwards they started a family and had two girls and a boy. Initially, Mr Forshaw farmed pigs at Copied Hall and then turkeys as well as training to be a teacher. He taught in several local schools until plans for the boarding kennels started to take shape in 1979. The kennels opened with its first ten guests in March 1980. His experience in child education and love of dogs were combined in his plans and he pioneered the concept of Free Range Kennelling that is very rare to find now. He set out to make Copied Hall a Holiday Camp for dogs not a Prison Camp - enabling them to enjoy their 'holiday' away from home as much as their owners! Mr Forshaw believed strongly that dogs should be allowed their freedom and be able to socialise with other like-minded dogs. He felt this less restrictive regime made for more relaxed dogs and reduced stress. He wanted to create a kennels where dogs were not confined to small cages runs all day. Instead, giving them the opportunity to move freely around large yards between runs with their friends, morning and afternoon, in a large grass field orchard. He believed that the majority of dogs are surprisingly neutral when there is no mum and dad or home territory evident. Even the use of leads was kept to a minimum as this created a connection that in the company of other dogs made them different. In 2000, Mr Forshaw finally retired and Copied Hall Farm was sold. Left to Right: Elana, Charlotte, Linda, Sam. However, he was absolutely insistent that whoever took over the kennels maintained his personal legacy as part of the sale agreement. Robert and Lisa Lemieux, with the help of their dedicated team including Kennel Manager Linda Windsor and Assistant Manager Elana Eldridge, have continued to develop and expand the kennels ever since. Today, many of Mr Forshaws original principles are still followed at Copied Hall, although the operation is a lot larger now and the facilities have been extended to include many more individual pens for those dogs just not suited to the Free Range system! However, everyone tries to stay true to the idea that dogs love their independence and enjoy nothing more than to run free. Mr & Mrs Forshaw are now both passed away but their legacy lives on.